Chilli sauce bottle filling equipment is automatic and functionally complete. Small investment will bring a high output and great quality. Chilli sauce bottle filling line all in compliance with the requirements of the food safety law.The chilli sauce bottle filling equipment is suitable for tomato sauce,peanut,butter,jam,seasoning sauce,creamy and granule. The chilli sauce filling machine is comprised of washing machine,tunnel sterilizing,labeling machine and packing machine. The nutrient content of hot pepper sauce is large, have been deeply praised by people. Chilli sauce bottle filling production line is specifically for a hot pepper sauce packaging research and development of modernization. Configurates adding sauce function (can add automatic powder, sesame seed, red oil). 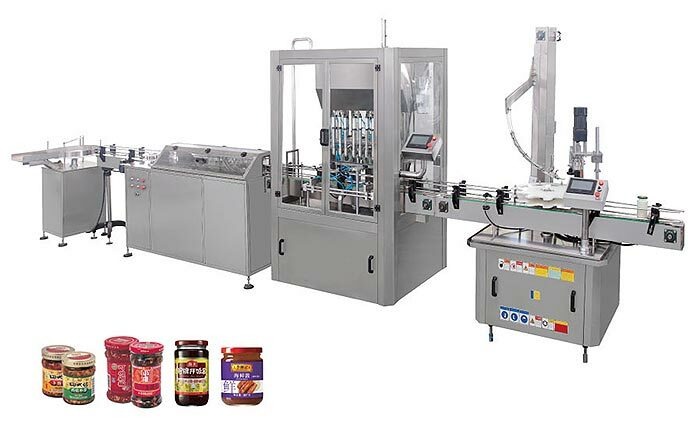 Chilli sauce bottle filling machine is suitable for the hot pepper sauce, chopped hot pepper, garlic sauce, hoi sin sauce, bean paste, sweet chilli sauce, fresh chili sauce products, Seal packaging effect, compact packaging lines, make products more marketing value.